Pixar’s resume has built such a prestige over the years, that the release of a new film from the studio is often cause for celebration. Though it was a little harder to get too excited for Cars 3. While 2006’s Cars was a good enough movie, it was far from Pixar’s best. Its 2011 sequel, Cars 2, broke Pixar’s then-undefeated streak of quality films, and was the first flat-out bad Pixar movie. But the Cars franchise remains Pixar’s biggest merchandise seller, so here we are with a third entry in the series. I tend to favor the Andy Warhol outlook in believing that, just because something is made with commercial intentions, it doesn’t automatically disqualify it as art. And Cars 3 ended up being a good example of just that. While it certainly won’t be in discussions of Pixar’s finest achievements, Cars 3 manages to avoid the pitfalls of its immediate predecessor and delivers a heartfelt (if familiar) tale that justifies the series’ continuation. First thing’s first, Cars 3, in many ways, seems like an apology to audiences for Cars 2. None of the original characters from the second film return (which is a little bit of a shame, as I actually enjoyed Michael Caine and Emily Mortimer’s characters, despite the film they were stuck in). Perhaps even more notably, Mater (Larry the Cable Guy), the comic foil of the first film who was the miscast star of the second, has a completely minimized role; only appearing in a small number of scenes and with few spoken lines of dialogue. The role of comic relief is mostly passed on to series mainstays Luigi (Tony Shalhoub) and Guido (Guido Quaroni), as well as newcomer Cruz Remirez (Cristela Alonzo), who serves as Lightning McQueen’s new trainer. Speaking of Lightning McQueen (Owen Wilson), the red race car is back to where he belongs as the central character in the film. Taking place a good deal of time after the events of the second film, Lightning McQueen is now a veteran racer, and he’s beginning to be upstaged by younger, newer racers who are changing the game to such an extent that many of Lightning’s old friends and rivals on the racetrack are heading for retirement. One newcomer in particular, Jackson Storm (Armie Hammer), is proving to be a thorn in Lightning’s side. During one such race, Lightning – desperate to beat Storm and prove he’s not ready to hang it up – overdoes himself and ends up in a terrible crash. Lightning fears he may end up like his mentor, Doc Hudson, and be forced into retirement without getting the chance to show what he has left. From there, Lightning’s sponsors sell their company to billionaire Sterling (Nathan Fillion), who plans to put Lightning through vigorous new training techniques to get him back on the winning side. When it looks as though Lightning is too old to handle these new training methods, Sterling wishes to send Lightning into a quiet retirement, and continue his legacy through branding. Lightning, wanting to decide for himself when he’s done, makes a bet with Sterling. If Lightning can win one more big race, then he gets to continue to race for as long as he sees fit. But if Lightning doesn’t win, he will agree to retirement. Sterling assigns Cruz Ramirez to help train McQueen who – along with Luigi and Guido – are ready to do whatever they need to make sure Lightning continues racing. It’s a simple enough premise, and echoes the 2006 original in a number of scenes (I suppose playing it safe to what worked just fine is better than whatever happened with Cars 2). But Cars 3 has enough heart to hold its own as a film. The Doc Hudson character (voiced by Paul Newman in the original Cars) was the heart and soul of the first film. When Paul Newman passed away in between the first two films, the character was written out of the sequel. An understandable choice on the part of the filmmakers, but no doubt the absence of the first film’s best character was one of the many aspects that left the second film feeling so empty. Cars 3 finds a way to keep the character’s presence intact in a way that’s still respectful to Newman, with flashbacks involving both returning dialogue from the first film, as well as unused lines recorded by Newman. It also helps this threequel that Doc Hudson’s passing is actually used as a thematic point, and not just present in a throwaway line like in Cars 2. The film as a whole has a nice message about growing older and continuing what you love, even if the world may suggest you’re passed your prime. And the presence of Doc Hudson brings back the heart the second film so sorely lacked. But it’s Cruz Ramirez who gives Cars 3 an identity separate from the first film, with her relationship and interactions with Lightning McQueen standing out as high points for the entire Cars series. And she even proves to be effective comic relief. Cars 3 is also a beautifully animated film. 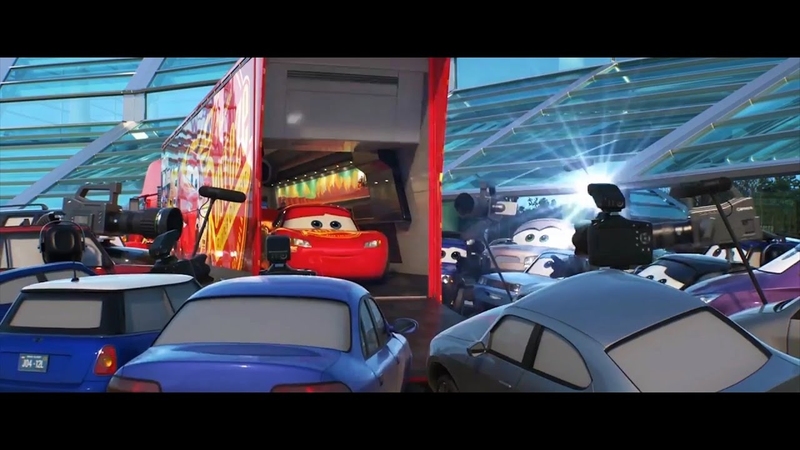 Though it uses many of the same characters and assets as the other films in the series, Cars 3 looks sleeker and more eye-popping than ever. The racing and action scenes in particular, are quite stunning to behold. If there’s any fault to be had with Cars 3, it’s simply that it is unambitious. Perhaps it has its reasons for playing things safe after Cars 2, but the similarities to the first film in Cars 3’s narrative are more than a few. And as unfair of a complaint as this may sound, the concept behind the Cars movies has always been far more creatively limited than Pixar’s other works. There’s only so much that can be done with talking cars both in terms of their movements in animation and the stories they can tell. Cars 3 does the best with what it has, and is certainly a worthwhile rectification for the Cars series, but if one were to compare it with Pixar films such as Inside Out, The Incredibles or Wall-E, then Cars 3 falls drastically short. With all that said, Cars 3 is a fun movie from start to finish. Its fast-paced action, coupled with its exquisite animation and charming characters (also including Doc Hudson’s former crew chief Smokey, voiced by Chris Cooper) make for a film that children can easily love, and one that may prove surprisingly entertaining for adults.